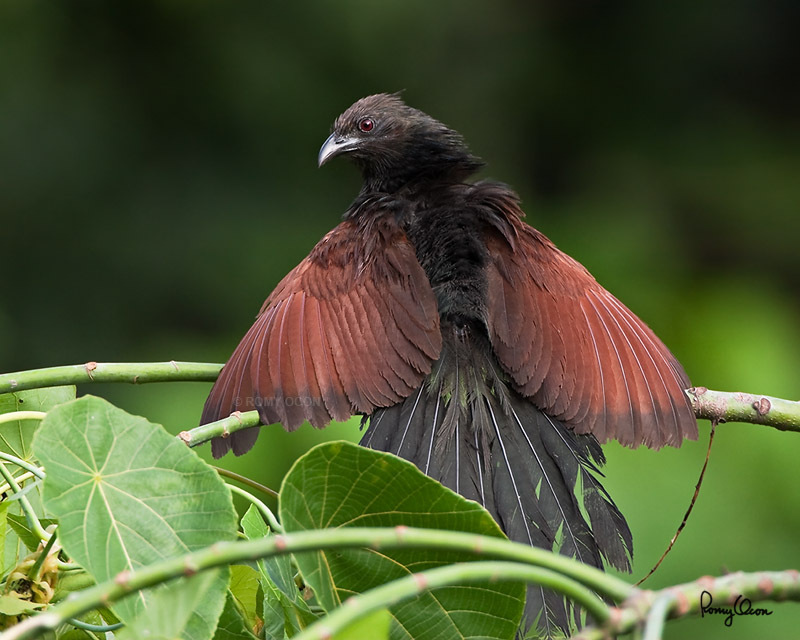 I chanced upon this endemic Philippine Coucal spreading and drying its wings in the open, along a trail at Subic rainforest in 2006. This bird has an average length of 17 inches and it ranges in all major Philippine islands except the Palawan group. Like other coucals, this one is normally shy. It skulks in dense vegetation, where a clean shot is nearly impossible. This is compounded further by the difficulty of exposing a dark bird in dim light. I used my vehicle as a blind to get close to this individual. Habitat – Common from grasslands to forest up to 2000 m.
Shooting Info – Subic rainforest, Zambales, Philippines, July 28, 2006, Canon 20D + EF 500 f4 IS + Canon 1.4x TC II, 700 mm, f/7.1, ISO 400, 1/320 sec, manual exposure in available light, hand held. I've been told a number of times about how the Philippines was a solid destination for bird watchers. After looking into it a bit, I can definitely say that everything that I heard is true. I guess it's time to pack those binoculars and sketch book.